Radiohead fans will be able to choose how much to pay for the band's next album, In Rainbows, which is available for download on 10 October. Instead of listing a price for the music, the group's website simply states "it's up to you" - and then adds: "No really, it's up to you." The announcement was made online by guitarist Jonny Greenwood. Fans can buy the download or a £40 "discbox", which includes two CDs, two records, plus artwork and booklets. Traffic to the site has made access difficult for fans at times, but the band's spokesman said it was being worked on. 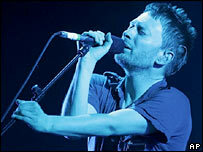 This will be Radiohead's seventh album, but it is their first without a record label, having fulfilled their contract with EMI following 2003's Hail to the Thief. The band are now "talking to a number of record companies" about releasing the album in a physical format early next year, their spokesman said. EMI are among the companies they are talking to, he added. The group have received critical acclaim for their previous albums, which have sold millions on both sides of the Atlantic. They are regarded by some music critics as the world's best rock band. The digital market is continuing to grow, with a 50% increase in digital single purchases in the first six months of the year, the BPI said in July. But downloads still only account for 10 to 20% of the overall music market, and that figure includes formats such as ringtones.